Yes, I probably skipped a few posts, but it was really hard to sit and write a blog post when I was so close to being able to print!!! 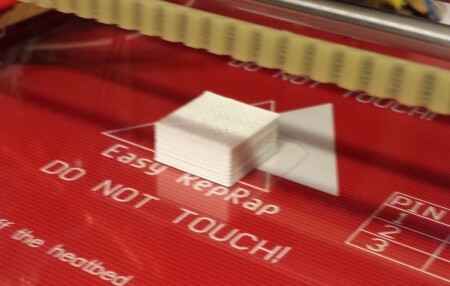 I did some calibrating and picked a small 2cm square and 1cm tall box for my first print. At first I had problems printing more than a couple of layers. Eventually, it wouldn’t print at all. I finally figured out that the upper part of the extruder was getting too hot and it was softening the plastic before it got to the nozzle. As a result, the plastic expanded and would not push through to the nozzle. After several attempts to cool the top part of the extruder, I found a solution that worked and I was able to make a successful print. Here is my first plastic “print”. There are still some refinements that need to be made to improve quality (for example, the box isn’t exactly 2cm x 2cm x 1cm), but I think I can say I have a 3d printer! The printer needs special software to run. On the printer there is an Arduino board (a open source circuit board with an Atmel microcontroller). 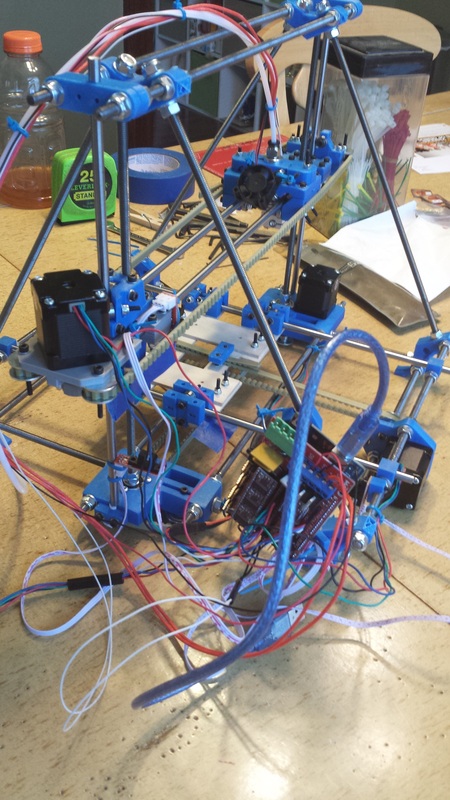 This Arduino controls all the parts of the printer and has it’s own program. This program has configuration options that needed to be set up for my printer and then it was uploaded from the PC to the Arduino by a USB cable. The standard software on the PC side for Reprap and open source 3d printers is Printrun. 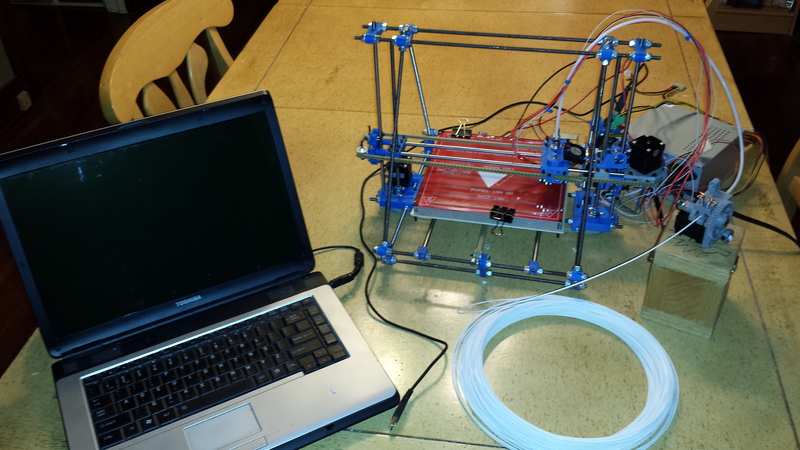 It is a set of Python programs that run on your PC to control your 3D printer. After installing Python and several Python libraries, I was able to install Printrun. One of the main programs in Printrun is Pronterface (yes, that is spelled correctly.) Pronterface connects to the arduino on your 3D Printer and lets you control you 3D printer using a graphical interface. I was able to move all the motors on the printer from Pronterface running on my computer. Now things are getting interesting! It’s getting easier to see how this is all going to come together. There are some little things left to do and some calibration, but the two main things are the heatbed and the assembly that actually feeds the plastic into the printer. Well, I made progress. I added the belts and motors for the three axes. One problem I had was with the gears. Some of the gears worked well with the teeth on the belt, but others did not and were pulling the belt unevenly. Using my Dremel, I modified the plastic gears so that the belt will fit better. It’s not pretty, but it seems to work for now. I will probably redesign the gear and print new ones once I get the printer working. Next, I hooked up the motors to the electronics, and all of it was powered by an old PC power supply. I used a simple test program uploaded to the arduino (part of the electronics) and could make the parts move along all three axes. Cool! Then it was time for the “printhead” – the hot end of the extruder. It is a piece of metal with a hole in the center for the plastic to enter. There is a resistor to heat up the end to melt the plastic – over 200 degrees C for some plastic. 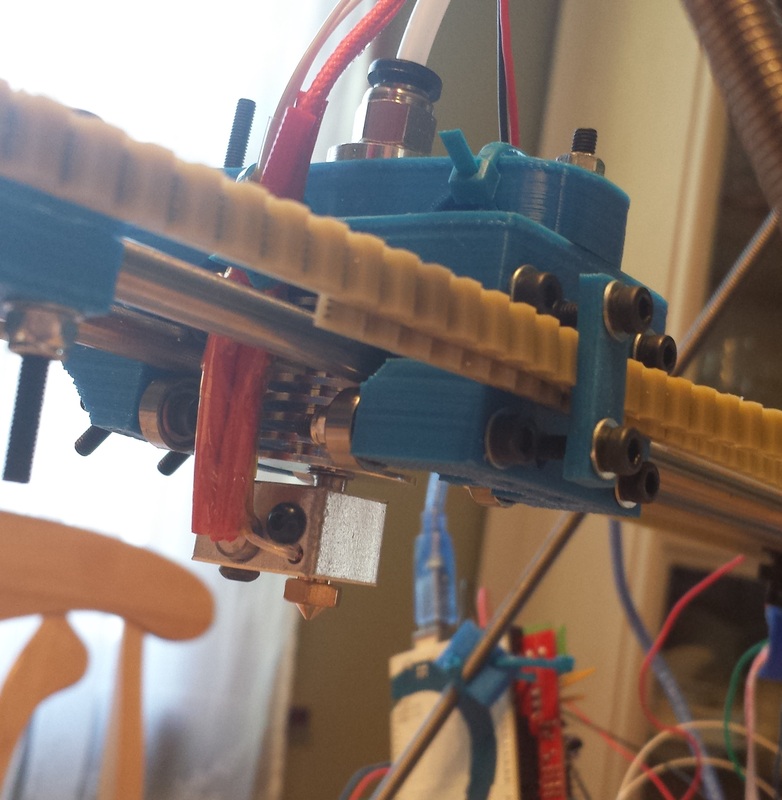 There is also a thermistor to keep track of the temperature and a fan to cool down the top part of the extruder because you don’t want the plastic to melt while it is in the feed tube. The wires all get routed along the feed tube back to the electronics that control them. As you can see – zip ties are my friend! You can see all of the electronics and the wires – I was going for the “impressively chaotic” look. It is starting to look more like a 3d printer. I made the X axis – the part in the center will move back and forth and hold the extruder (which is the part that prints the plastic.) By the way, the part in the middle was tricky – 10 bearings and lots of screws. I have most of what I need from Fastenal. I also purchased a few things from Menard’s. The list is down below. 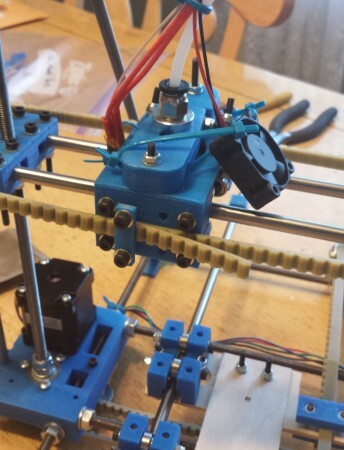 Did I mention that this particular 3d printer design is “open source”. That means the design is freely available to anyone. Not only can anyone get the plans and use them, but anyone can make their own changes . . . and many people do. So you have people all over the world improving the design. It’s nice to have those improvements, but sometimes they aren’t documented very well and it can get confusing. Yes, we have been talking about 3D printing for a long time and now we are starting to make progress toward our very own 3D printer. Today we started building a Mini-Mendel (aka Huxley). This is one of the RepRap 3D printers. 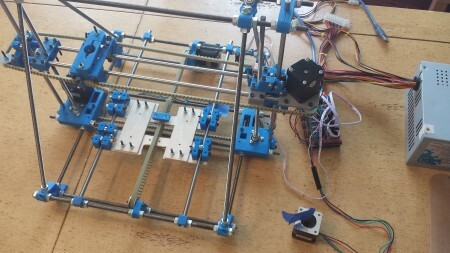 If you are not familiar with RepRap, it is a collection of 3D printer designs that use 3D printed parts (Yes, you have to print parts on a 3D printer in order to build the 3D printer). They are open source – that means the designs are available for free. I plan to post details and pictures here as the build progresses. Try out Ben’s new PacMan games, programmed in Scratch. Use your arrow keys to move Pac Man around to eat all the red pills and gain points. The larger blue power up pills allow you to eat ghosts for a period of time while they are flashing. They are worth lots more points! Any other time PacMan loses a life if a ghost touches him. He has three lives, and then the game is over. Beware, the ghosts get faster each time you clear the screen of red pills. NOTE: The games start automatically so you’ll need to press the stop sign icon in the upper right to pause them. Make sure you stop one so the other will play faster. The first version has a special feature. When you loose your three lives and game ends, you can start it again and the score will add on to your previous game score. It’s like when you can put in more coins and continue play on an arcade game. If you really want to start over at zero, you can do that by pressing the Reset Score button. The second version, PacMan Extreme doesn’t offer that feature. We want to know your high score in the second game, so leave us a comment!